There has been a limit placed by society on the "right" amount of information to share online and I think that this creates a lot of boundaries because we then think that we can't reveal more about ourselves in fear of being seen as an "oversharer". But, what is this limit? How much can we allow people to know? Are we allowed to tell people that we don't feel comfortable with them doing something or saying something or is that oversharing because we are revealing our insecurities? As an avid user of social media, I firmly believe that the only person who can decide how much information you place about yourself online is you and if you feel comfortable with it, then do it. I often advocate speaking out about mental health online as I am determined to make a difference in how the world sees these things that they are too scared to talk about. It's important for people to understand how different members of society function and how various situations can make humans act differently which is why I openly speak about how autism and anxiety affect my day to day life through this blog and my various social media accounts. When I was younger, around year 9 at secondary school, I was accused of being an "attention seeker" among an abundance of other things because I spoke out about the troubles I was facing which inspired me to create this blog because I realised that I wasn't afraid of what people thought and it isn't my problem if they unfollow me on Twitter or delete me off of Facebook because at the end of the day, I will be the one who is more open minded about the world while they are still convincing themselves that there is no such thing as mental health problems and if there are, they can just be shut away. However, as much as I am happy to share personal events online, some people don't want to and that's ok. For example, someone might not yet be ready to openly announce their mental illness because they are only just coming to terms with things themselves, everyone deals with things differently. I remember when I was diagnosed as autistic and for the first year, I didn't want other people to find out and I quite happily hid the "label", never daring to post anything online in fear that people were going to treat me differently. However, that's when I realised that's all it is, a "label", it doesn't define who I am and what I have achieved, it just makes me a bit different and maybe people did start to treat me differently when they found out but I see this as a positive because it helped me to remove negative people from my life. My point here is that if you are a person who is open to sharing personal stuff online, don't force other people to and don't criticise them if they share the bare minimum because we are not all the same. I think that the problem with social media is that you see all of these famous people and all of the Instagram models and your first instinct is that you want to be them. You scroll through their profiles and see this polished life that they have contrived in their images and tweets and so you assume that there can't be anything wrong with them, they don't post anything "too personal" and neither should you. This results in an image being created of yourself online that is incredibly dissimilar to you in real life because you believe that's what people want to see. There's an idea that people are only interested in your full face of make up and so you can't possibly post a photo when you're having a bad day or your hair isn't going right or you've woken up to a spot on your face because that just isn't going to fit in with your Instagram theme. We force ourselves to pretend to be perfect on social media and that takes away the emotion and feeling in it. There's all these social expectations which we were never explicitly told but as we grow up, we become very aware of them. For example, the stereotype that males have to be strong and god forbid they post about feeling bad or stressed because they aren't supposed to have these feelings; they are supposed to be masculine. Then we wonder why the male suicide rate is so high, especially with young adults. So, what I want to know is how can someone sit there and criticise another individual for posting about needing help online? I want to know how someone can be so heartless to just completely ignore the fact that this person is evidently struggling and just focus on the fact that "well they shouldn't be posting it online, nobody needs to see this"... I think it's selfish. If you have communication with said person online then they obviously trust you enough to allow you to see their posts because it takes a lot to admit that you need help and then to just be ignored because it's not "socially acceptable"... no wonder why it's seen as "oversharing" when it is expected for people to just lie and create these "perfect" lives online. I am really just rambling now but my point is that there's no such thing as oversharing, share as much or little as you want. This is such a beautiful post. I 100% think this is also an off-line problem as well. 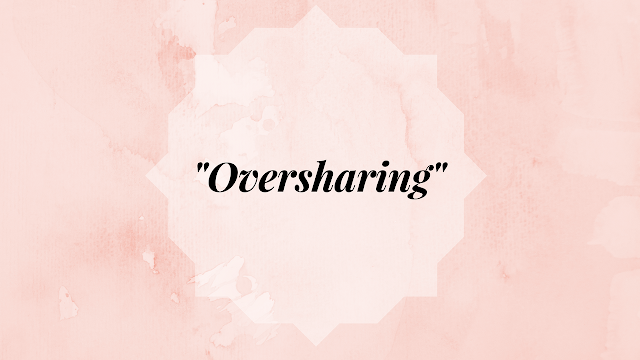 From my experience, whenever I try to have a deep conversation with people, they have told me I'm over sharing and they become uncomfortable. Thank you so much!! Oh no I agree completely - maybe that's something else I'll write about soon. I definitely agree with this post. I always saw myself as an oversharer because I don’t feel the need to hide things but that’s just who I am!